Every successful dealership is aimed by the idea about how to increase customers’ rate on their website. There is no doubt that one of the most important factors is the constructive SEO strategy. Optimizing your website with offsite SEO techniques is as important as optimizing with onsite SEO. People can find information not just on Google. Motorxloo is aware of this and is ready to help their prospects with this. According to some experts, the offsite SEO is responsible for about 75% of the page rank, while onsite SEO contributes approximately 25%. Offsite SEO is the process of promoting your website across the web. It is accomplished by other sources that are able to increase search engine performance for target keywords. They are related to your onsite content and exist in offsite direct links. Offsite SEO expands beyond just your website. You need to follow its major factors. Build your brand awareness using link building. Get people redirected to your website from other sources. These tactics will work wonders for you. The content along with inbound links is unique and qualified. Poor quality sites linking back to yours, will cause bad results for you in Google’s eyes. Promote unique links with the help of blogs & forums. Find forums online that are related to your sites’ niche and get involved within each community. You can also write a blog and give your visitors a reason to keep returning to your website. Keep up to date with your latest posts. 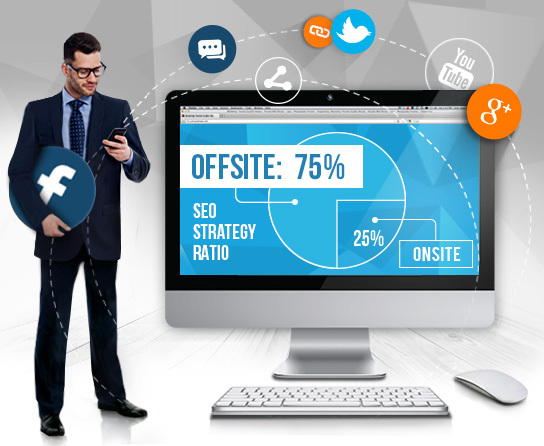 Another effective tool for your offsite SEO is social media platforms. You can establish authority on a topic, and drive traffic to your website. If you have accounts on social media websites, take time to learn how to use them effectively. The social network platforms have their own unique algorithm strategy that works to bring results to their users. Add your links to your social accounts. Rise your popularity with the help of social shares and likes. If you increase the social engagement of your blog pages, you will also increase their ranking positions on the search engines. Motorxloo suggests you use our checklist packages. Depending on your expectations and abilities, you can choose from Start Up to Enterprise SEO service. Take a closer look at all the options and decide which one will suit you perfectly.